Elizabeth Maconchy was a composer of great versatility and unfailing integrity, amply deserving of a British critic’s description of her as ‘one of the most substantial composers these islands have yet produced’. Born to Irish parents in Hertfordshire on 19 March 1907, she grew up in rural Ireland, playing the piano and writing music from the age of six. She studied at the Royal College of Music with Vaughan Williams, who remained a lifelong friend; but she was attracted less by English pastoralism than by the central European modernism of Bartók and Janáček, and she completed her studies with K.B. Jirák in Prague. 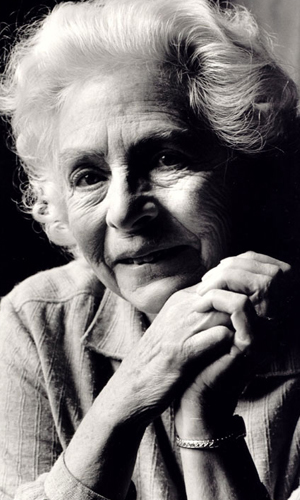 In the post-war era, Maconchy was greatly in demand as a composer amongst the leading professional ensembles, orchestras and soloists of the day, whilst also writing for amateurs and students, and was recognised as a leader of her profession: she chaired the Composers’ Guild of Great Britain, was President of the Society for the Promotion of New Music, and in 1987 was appointed Dame of the British Empire. She lived in an Essex village with her husband, the scholar and medical historian William LeFanu, to whom she was married for over sixty years; the younger of their two daughters is the composer Nicola LeFanu. ‘Betty’ Maconchy, as she was affectionately known by many, died in November 1994.